Courtesy Y. Hezaveh, Stanford Univ. ; ALMA (NRAO/ESO/NAOJ); NASA/ESA Hubble Space Telescope. A closer look at a gravitational lens image reveals a dwarf dark galaxy lurking in the halo of a much larger galaxy. Many more such objects are suspected, and their discovery could help astronomers understand the nature of dark matter. Close examination of a gravitational lens image yields a surprise. Supercomputer analysis indicates dark matter dwarf galaxy is causing the lensing. Discovery promises to resolve discrepancy between observed and predicted satellite galaxies. Subtle distortions hidden in this stunning image taken by the Atacama Large Millimeter/submillimeter Array (ALMA) are telltale signs that a dwarf dark galaxy is lurking in the halo of a much larger galaxy nearly four billion light years away. Hiding in the shadows. Analysis of ALMA observations of a gravitational lens reveals an intriguing object in the halo of the foreground lensing galaxy — possibly a dwarf dark galaxy. Courtesy Yashar Hezaveh; ALMA (NRAO/ESO/NAOJ); NASA/ESA Hubble Space Telescope, and the National Radio Astronomy Observatory. In 2014, as part of ALMA’s Long Baseline Campaign, astronomers studied a variety of astronomical objects to test the telescope's new, high-resolution capabilities. One of these experimental images was of an Einstein ring. The gravity of a massive foreground galaxy bent the light emitted by another galaxy nearly 12 billion light-years away to produce the ring. In a new paper accepted for publication in the Astrophysical Journal, astronomer Yashar Hezaveh and his team at Stanford University explain how detailed analysis of this widely publicized image uncovered signs of a hidden dwarf dark galaxy in the halo of the more nearby galaxy. “We can find these invisible objects in the same way that you can see rain droplets on a window. You know they are there because they distort the image of the background objects,” explains Hezaveh. In the case of a raindrop, refraction causes the distortions. In this image, the gravitational influence of dark matter generates similar distortions. For their analysis, the researchers harnessed thousands of computers working in parallel for many weeks, including the US National Science Foundation's (NSF) most powerful supercomputer at the National Center for Supercomputing Applications. Using Blue Waters, researchers searched for subtle anomalies that had a consistent and measurable counterpart in each ‘band’ of radio data. “We can find these invisible objects in the same way that you can see rain droplets on a window.” ~Yashar Hezaveh. From these combined computations, the researchers were able to piece together an understanding of the diffuse and predominantly star-free region around the galaxy. This analysis turned up a distinctive clump smaller than one-thousandth the mass of the Milky Way. 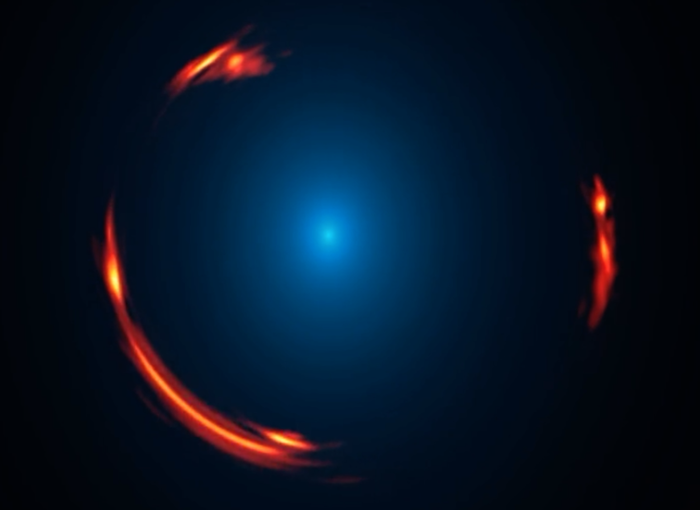 Because of its relationship to the larger galaxy, estimated mass, and lack of an optical counterpart, the astronomers believe an extremely faint, dark-matter dominated satellite of the lensing galaxy may cause this gravitational anomaly. According to theoretical predictions, most galaxies should be brimming with similar dwarf galaxies and other companion objects. Detecting them, however, has proven challenging. Even around our own Milky Way, astronomers can identify only 40 or so of the thousands of satellite objects that are predicted to be present. Makes up about 80 percent of the mass of the Universe. Made of particles that don’t interact with visible light or other forms of electromagnetic radiation. Has appreciable mass, so it can be identified by its gravitational influence. “This discrepancy between observed satellites and predicted abundances has been a major problem in cosmology for nearly two decades, even called a 'crisis' by some researchers,” said Neal Dalal of the University of Illinois, a member of the team. “If these dwarf objects are dominated by dark matter, this could explain the discrepancy while offering new insights into the true nature of dark matter,” he added. Computer models of the evolution of the Universe indicate that by measuring the ‘clumpiness’ of dark matter, it’s possible to measure its temperature. So by counting the number of small dark matter clumps around distant galaxies, astronomers can infer the temperature of dark matter, which has an important bearing on the smoothness of our Universe.